This entry was posted in Addiction on June 27, 2018 by Baxter Ekern. N – Being a model for ten years, I can tell you all that addiction is something that affects a lot of young girls and boys. I hope that there are models watching this conference who are inspired to get the help that they need today. J – One question an individual had for you is that, for young people interested in entering the modeling profession, you hear many stories of how they lost the weight or abusing drugs to be successful, can you speak to that a little bit? N – The modeling industry is a very strict and intensely competitive environment, similar to sports, beauty contests, or ballet, where you are paid based on your looks. There is a lot of pressure to fit in and be the best. With that, it opens the door for people to abuse supplements or pills or drugs to fit in or try to be the best. Sadly, these substances are so easily and readily available, if not through the street, through your agent. 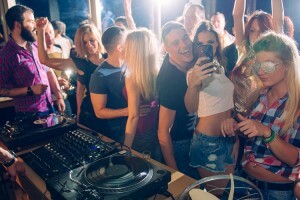 The abuse also happens through party promoters, because you are often invited to parties after your job, there are parties every night, making getting drugs or pills easier. I have been sober for six years, but when I was modeling, it was so easy for people simply to give me Adderall, cocaine, or ecstasy. These drugs were intended to do a lot of things, but one thing I really looked for was for them to take me to another level of consciousness. I was so messed up; I wouldn’t eat for days. So, people need to know that the modeling industry isn’t just a strict and repetitive lifestyle, it is a party lifestyle. People don’t realize, or forget, that it is young teenagers working in this environment. Parents are often not with their children as they model. When that child or teenager signs their contract, they are with their agent most of the time. This becomes dangerous in many ways. The brain is so vulnerable at that young age, and it’s still forming and adding drugs to that vulnerable developmental equation is a recipe for disaster. Even something as seemingly “harmless” as Adderall can be dangerous. It is such a widely distributed drug meant to be prescribed for Attention-Deficit Hyperactivity Disorder, but so many models use it to lose weight. This can also become problematic if the adolescent model already has a predisposition to addiction. I began using Adderall to help me lose weight but quickly moved to using other drugs. People might say, “I’m just using Adderall” but they are likely going to begin using other, harder, substances. About the Presenter: Nikki DuBose is a model, author, and advocate. She is the Co-Founder of The Artists League for Change, a national nonprofit dedicated to preventing mental health issues and abuse through the creative arts, and is an Ambassador for the Shaw Mind Foundation. Her debut memoir, Washed Away: From Darkness to Light was released September 30, 2016, in the U.S. and will be released in French in 2018 with Editions du Rocher. Nikki has been featured on television shows and networks such as The Doctors, TD Jakes, CBS Los Angeles, and the Oprah Winfrey Network, and profiled in publications such as People, LA Times, and Vogue UK. She worked alongside Assemblymember Marc Levine on California Assembly Bill 2539, which addressed the need for workplace protections and health standards in the modeling industry. She gives talks regularly on her recovery at universities and treatment centers and writes extensively on mental health, political issues, and the modeling industry on the NY Daily News, The Huffington Post, PsychCentral, and more. About the Transcript Editor: Margot Rittenhouse is a therapist who is passionate about providing mental health support to all in need and has worked with clients with substance abuse issues, eating disorders, domestic violence victims, and offenders, and severely mentally ill youth.